emerging demand for authenticity testing and certification of high-value food, together with the competitive edge from the high level of professionalism, integrity and reputation of Hong Kong’s testing and certification industry. 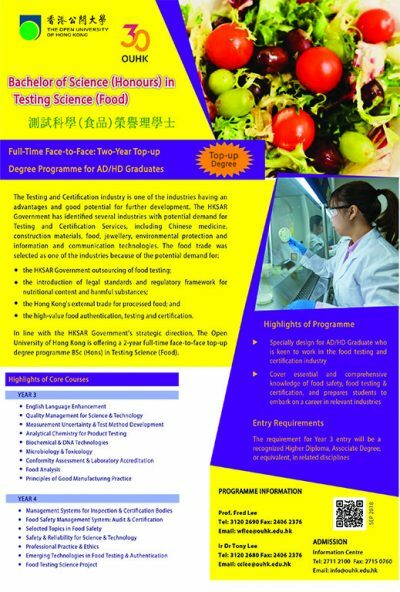 To further align with the Government’s strategic direction to drive the development of the Testing and Certification industry, the OUHK is offering a 2-year full-time face-to-face top-up BSc (Hons) in Testing Science (Food) programme starting 2014. The requirement for Senior Year entry will be a holder of recognized Higher Diploma, Associate Degree, or equivalent, in Testing and Certification, Food, or a related discipline.